This meal would have been a perfect idea for an Easter brunch, had I had my act together and actually posted it before Easter. Sadly I did not; and so instead I am recommending this as an easy and elegant meal for an indulgent weekend brunch – which, coincidentally, is exactly what the Husband and I did this past weekend! As much as I love my three square meals a day, on the weekends we never seem to get going early enough to manage breakfast and lunch, and so we usually end up eating a larger brunch time meal somewhere around 1100. 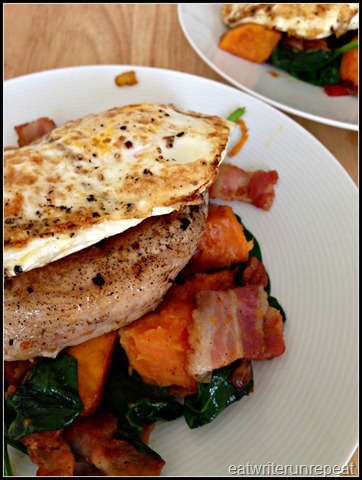 This is the perfect combination to keep you satisfied all the way through dinnertime: you have tons of protein from the pork chop and the eggs combined with the carbs in the sweet potatoes, and of course I had to throw in a little bit of green in the form of spinach, just for some color! I have to be honest, I’m not sure I could make this meal come together without the help of a second pair of hands. My husband cooked the pork chops in a cast iron skillet while I handled the sweet potatoes, and once the chops were done and resting he fried up the eggs. It can be done by one person – if that one person has a good grasp of the timing while cooking. Sadly, that’s a talent that I do not possess. And if you’re not rushing off to work after this? I highly recommend serving with champagne. Season your pork chops and melt your coconut oil (approx 1tbsp) in a cast iron skillet over medium heat. Sear the pork chops on both sides and cook until pork is cooked through, about 4 minutes each side. Set aside to rest. Meanwhile, in another skillet, cook the bacon (if using) until partially done. Add the sweet potatoes, onion, and pepper and combine. Add about one tablespoon of water to the pan and cover to speed up the cooking process. Stir occasionally and cook until sweet potatoes are soft – about ten minutes, depending on how small your potatoes are diced. Add the spinach and pecans and cook until spinach is wilted. While the potatoes are cooking (wait until they are just about finished), fry the eggs in some olive or coconut oil to taste. 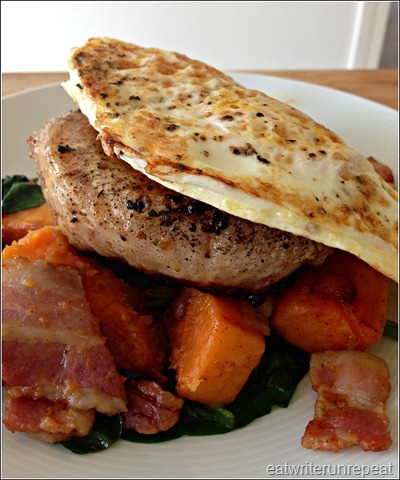 To serve, place a bed of sweet potato hash on a plate, add the pork chop, and top with an egg. Done! 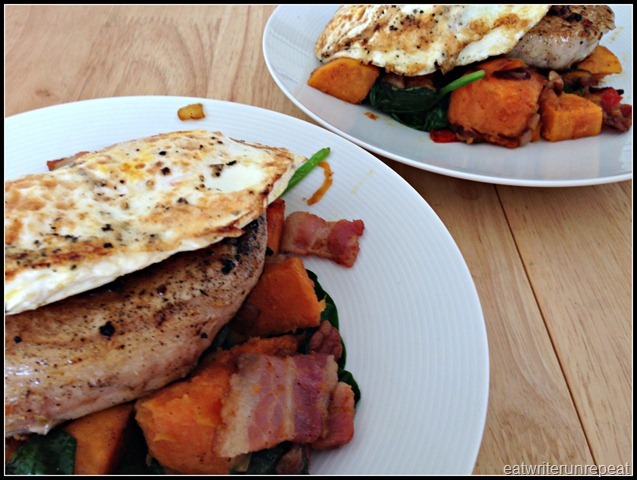 Posted on 21 April 2014 20 April 2014 by BeePosted in Breakfast, Paleo, PorkTagged breakfast, brunch, paleo, pork.